Navodaya Vidyalaya Samiti various #posts 2017 direct #recruitment notifications/Audit Assistant ,Hindi Translator, Stenographer, Lower Division Clerk, Female Staff Nurse, Catering Assistant, LDC / Storekeeper, Lab Attendant posts 2017 in #NVS: Navodaya Vidyalaya Samiti has given an advertisement for various posts i.e Audit Assistant , Hindi Translator, Stenographer, Lower Division Clerk,Female Staff Nurse, Catering Assistant, LDC / Storekeeper, Lab Attendant posts in NVS on direct recruitment basis, will be published in the Employment News on 11th-17th November. 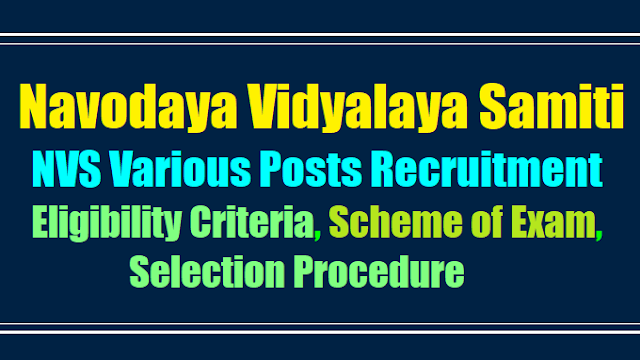 Application are invited for filling up theAudit Assistant ,Hindi Translator, Stenographer, Lower Division Clerk,Female Staff Nurse, Catering Assistant, LDC / Storekeeper, Lab Attendant posts on directrecruitment basis in the Navodaya Vidyalaya Samiti for its Hqrs. Office at Noida and Regional Offices located at Bhopal, Chandigarh, Hyderabad, Jaipur, Lucknow, Patna, Pune and Shillong.NVS various Non teaching posts 2017 recruitment notification/NVS Jobs, Navodaya Jobs, Audit Assistant ,Hindi Translator, Stenographer, Lower Division Clerk, Female Staff Nurse, Catering Assistant, LDC / Storekeeper, Lab Attendant posts, last date, application form, how to apply, eligibility criteria, selection procedure details given here. 01 Audit Assistant 9300-34800 (GP 4200) Level 6 18-30 years Essential: B Com from a recognized University. Desirable: 3 years experience of accounts works in a Govt. / Semi Govt. / Autonomous Organizations. Note: Direct recruits will have to acquire proficiency in operating PCs and pass such test in this regard as the Samiti may require. Hindi to English and vice versa in Central / State Government Offices including Government of India Undertakings proof correction. 03 Female Staff Nurse 9300-34800 (GP 4600) Level 7 Up to 35 Years 1. Essential : a) Passed Sr. Secondary Examination (Class XII) or equivalent and b) Grade ‘A’(Three years) Diploma/Certificate in Nursing from recognized Institution. OR B.Sc(Nursing) from a recognised University/ Institution. 2. Registration with Indian/ State Nursing Council. 3. Practical experience of two years in Hospital/Clinic. Desirable : Working Knowledge of Hindi/Regional Language and English. 04 Stenographer 5200-20200 (GP 2400) Level 4 18 to 27 year Essential: 1. Senior Secondary School Certificate (Class XII) 2. Shorthand speed of 80 words per minute and typing speed 40 words per minute in English. OR Shorthand speed of 60 words per minutes and typing speed of 30 words per minute in Hindi. Note: Direct recruits will have to acquire proficiency in operating PCs and pass such test in this regard as the Samiti may require. 05 Catering Assistant 5200-20200 (GP 2400) Level 4 Up to 35 years 1. Secondary School (X class pass) and 2. Three Years Diploma in Catering or equivalent from an Institution recognized by Ministry of Tourism, Govt. of India/State Govt. OR Passed Sr. Secondary (Class XII) from CBSE with Hotel Management and Catering as Vocational Subject and at least one year experience in catering. OR Passed Sr.Secondary (Class XII) or equivalent and one year diploma in catering or equivalent from a recognized institution with three years experience in catering in reputed institution/hotels. OR Trade proficiency Certificate in Catering with a minimum of 10 years of service in Defence Services of regular establishment (for Ex- Servicemen only). 06 07 Lower Division Clerk (HQ/RO Cadre) Lower Division Clerk/ Store Keeper (JNV Cadre) 5200-20200 ( GP 1900) 18-27 years ESSENTIAL: 1. Senior Secondary (Class XII) certificate from a recognized Board with 50% marks and possessing minimum speed of 30 words per minutes in English typing or 25 words per minutes in Hindi typing correspond to 10500 KDPH as on average of 5 key depressions for each word. OR Passed +2 level or Senior Secondary Certificate from CBSE/State Govt. With Secretarial Practices and Office Management as Vocational Subjects. Desirable: 1. Knowledge of computer operation and data entry acquired either as a subject at +2 level or through 6 months diploma in computer from a recognised institution or through computer literacy certificate at school level. 2. Experience in accounts / administrative matters in Govt. / Semi Govt. / Autonomous organization. Note: 1. Preference will be given to candidates having passed +2 from CBSE with secretarial practices and office management as vocational subjects. 2. The appointing authority shall decide each time depending upon the requirement whether the typing speed should be in English or Hindi. 3. Direct recruit will have to acquire proficiency in operating PCs and pass such test in this regard as the Samiti may require. 08 Lab Assistant 5200-20200 (GP 1800) Level 1 Between 18 and 30 years Middle Pass with General Science. Age relaxation :Relaxation in upper age limit as per Govt. of India rules will be admissible. Regional Offices Bhopal, Hyderabad and Shillong had issued separate advertisement and invited applications from eligible candidates for non-teaching posts in JNVs functional under their administrative control. Regional Office Chandigarh, Patna and Pune had also issued separate advertisement and invited applications from eligible candidates for these posts in JNVs functional under their administrative control. Written examination / Trade test was also conducted by RO Chandigarh, Patna and Pune. However, final result was not declared due to administrative reasons. A conscious decision is taken to cancel all advertisement issued as well as Written Examination / Trade Test conducted for these posts by respective Regional Offices of the NVS as referred above and to conduct a centralized recruitment. It is further decided to allow all such eligible candidates who had applied as well as appeared in Written Examination / Trade Test, as the case may be, to participate in this centralized recruitment drive on the eligibility conditions / criteria mentioned in the advertisement issued by respective Regional Offices. Applications of such candidates, as arranged by respective Regional Offices have been integrated centrally on the designated recruitment portal. Such candidates are need not to apply afresh and need not to pay fee again. However, they have to update their details on the designated portal as mentioned at 3(A). Applications invited by the NVS(HQ) for the post of Audit Assistant, Hindi Translator, Stenographer & LDC from eligible candidates vide notification published in Employment News dated 12th – 18th March, 2016 have also been integrated on the designated recruitment portal. Candidates already applied against these posts against the said advertisement also need not to apply afresh and need not to pay fee again. (a) Selection Process: Candidates will be shortlisted on the basis of their performance in online Computer Based Test (CBT). NVS reserves the right to decide the cut off marks in online Computer Based Test (CBT). The decision of the NVS about the mode of selection to the above posts shall be final and binding. No correspondence will be entertained in this regard. For Stenographer & LDC / Storekeeper post, candidates shortlisted against CBT will be called for Skill Test which is only qualifying in nature and carries no weightage before considering them finally. In case a candidate fails to qualify the skill test, their candidature would be rejected. However, the mode of selection whichever for all the above posts will be the sole discretion of NVS and may be changed. (b) centre may be changed.The candidate will be allowed to choose 3 (Three) written examination centres out of available list. However, NVS reserves the right to alter/change city of Examination other than given choice based upon availability of infrastructure and other arrangements required for conduct of Computer Based Test. Only 1 (One) written examination city will be allowed to the candidate against three choices opted by him. Option once submitted can not be altered. (c) Reservations and Relaxations to PWD Candidates: Persons with disability of 40% or more, if so desires, will have to bring their own scribe to assist them in the examination. There is no restriction with regard to educational qualification or age etc for the scribe. Compensatory time to be allowed in this case is 20 minutes per hour of examination. All candidates with disability not availing the facility of scribe additional time of minimum of forty minutes for examination of two hours duration. Reservation for the person with disabilities in respect of the current year vacancies will be given as per the Govt. Rules. However, posts are identified suitable for persons with disabilities will be as per O.M.No.16-15/2010-DD-III dated 29.7.2013 by Office of the Chief Commissioner for Persons with Disabilities, Ministry of Social Justice & Empowerment. (d) No candidate will be admitted for the online Computer Based Test (CBT) without the proper Admit Card. Candidates are required to apply Online through NVS web-site i.e. www.nvshq.org / www.nvsnt2017.org No other means/mode of application will be accepted. No hard copies of application and documents are required to be sent to NVS in connection with the online application. 2. Email-ID & Mobile Number :, candidate has to update his / her functional E-Mail ID& mobile number. These are mandatory. 3. They have to opt the order of preference of Regional Offices/HQ for posting for joining in priority which is to be considered by NVS in case of his/her selection. However, the region allotment will be done as per the performance of the candidate in the final merit list drawn. Note: (a) for old Candidates no fees are required to be paid. (b) Communication with regard to updating the details has already been sent through Registered/Speed Post at the registered communications addresses against earlier advertisement. (c) Old Candidates are not allowed to update their eligibility criteria such as age, qualification, experience etc. Their eligibility criteria will be decided on the basis of earlier applications submitted by them in response to advertisement issued by respective Regional Offices mentioned in the above table. B. Important Instructions for "Fresh Candidates":. Note : (i) Detailed instructions may be referred at the time of applying On-line application. (ii)Candidates in their own interest are advised, not to wait till the last date & time for applying online. They should register well before the time for last date of submission of applications. NVS shall not be responsible, if candidates are not able to submit their applications due to last time rush.